Serving the entire Tampa Florida area since 2002. Award winning quality and service with modern, state of the art equipment and the experience customers come to expect from a professional pressure washing & roof cleaning service company. We have cleaned whole Tampa area neighborhoods including cleaning of the following types of roofs; flat tile roof, barrel tile roof, slate roof, shingle roof, clay tile roof and metal roof. Low-pressure washing of building exteriors and hot water pressure washing of the concrete walkways. Your Tampa roof cleaning will be treated the way your roof should be, by adhereing to the strict ASPHALT ROOFING MANUFACTURERS ASSOCIATION guide line for proper roof cleaning. Absolutely no pressure washing will be performed on your roof as we believe the only safe way to wash any roof is a chemical softwash. This cleaning solution is gently applied to the roofs surface and with proper dwell time, the existing algae and mold quickly dies off and disappears leaving a clean, refreshed roof. 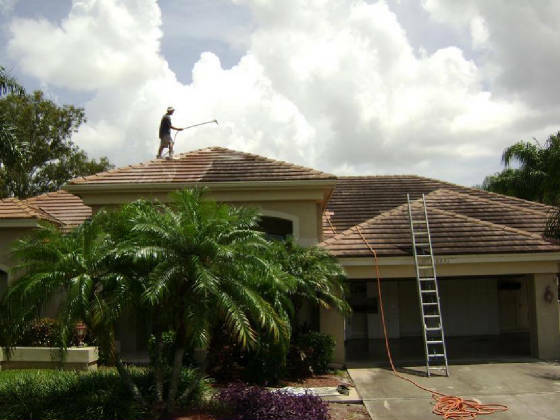 Please go on to the next page for a detailed list of our roof cleaning & pressure washing services for the Tampa, Florida area and a brief description about them.